The historical village of Syderstone is recorded in the Domesday Book of 1086, but the village pre-dates even this. Originally named “Sidsterne” by the Anglo Saxons which is thought to mean “large estate”, from the Old English “Sid” meaning broad or extensive and “Sterne” meaning property. The village has a large common spanning approximately 4 square miles, and being a Norfolk Wildlife Trust reserve, it provides a home to some interesting wildlife and is perfect for dog walkers. There is also a medieval church, thought to be 1 of 124 in Norfolk with a round tower. Nearby you also have the Sculthorpe Moor Nature Reserve which is a rare fen habitat that is managed for wild birds of prey and the eco-systems on which they depend. Situated between Fakenham, South Creake and Docking and just a short drive from the coast where you will find the popular coastal villages and towns of Titchwell, Thornham, Holme-Next-the-Sea and Hunstanton. The great beaches, nature reserves, walks and restaurants all await your exploration! You are spoilt for choice with great places to dine out in North Norfolk. Here’s just a few that you should have on your list of must visits: The Duck Inn at Stanhoe, The Orange Tree in Thornham, Socius in Burnham Market and The White Horse at Brancaster Staithe. For a luxury stay in Syderstone, take a look at Oystercatcher! 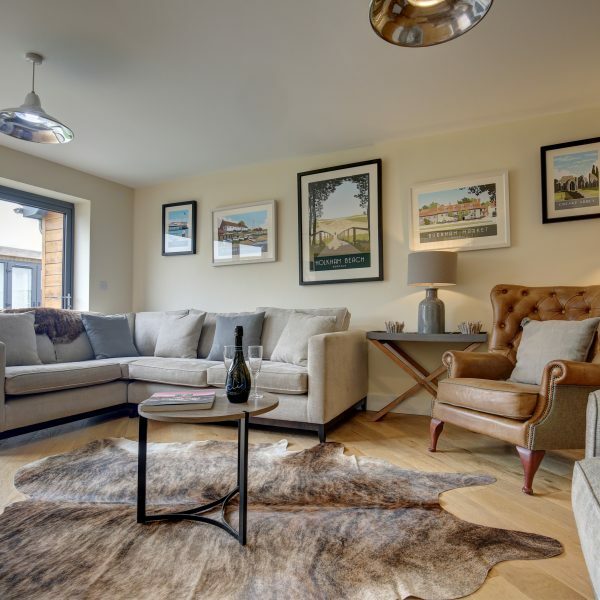 Created to offer groups of families and friends a comfortable and luxurious stay and complete with many modern touches that make the house a pleasure to inhabit, Oystercatcher is a real gem! With a maximum occupancy of six people across its four bedrooms, guests can enjoy the space offered in the generous living areas, all of which are joined through superb design. By using the large bifold doors, you are able to open the lounge and kitchen/dining room to the enclosed rear garden, here you will find further seating and a summer house. This really is a property that everyone will have space to relax in.